I don't know about you, but I think these tomatoes look pretty damn glorious. Yes they're mottled, and knobbly, and not a single one is fire-truck red ... but bite into one and you're going to have a mouthful of happiness. Juicy, flavourful, meaty happiness. Then sprinkle one with sea salt ... close your eyes ... and bite. do they really, really taste like tomatoes? And isn't that what life is all about? Eating stuff because it tastes good? Not eating stuff because it's there? I was going to tell you all about heirloom veggies (and fruits, which tomatoes technically are) ... about how these are varieties of the foods we love that were cultivated before mega-farming and hydroponics emerged ... how they're tastier but uglier and don't store so well for weeks on the shelves ... But you know what? You can learn more about heirloom varieties here, if you'd like. I like that we just talked about taste. Rustic! Just goes to show you can't tell a tomato by it's bumps, lumps and battle scars from making it through the natural growing process. This post made me cringe, then smile. Thanks, I'm with you on the important thing here. My husband belongs to our local Rotary chapter, and for one meeting, the owner of an upscale grocery chain here in San Jose came to talk about produce. He said he did experiments where he'd stand outside the market with two tomatoes -- one all bumpy and funny looking like your Ugli tomatoes above, and one that was a pristine-looking but flavorless cold-packed supermarket tomato. He sliced them all up and gave out tastes. 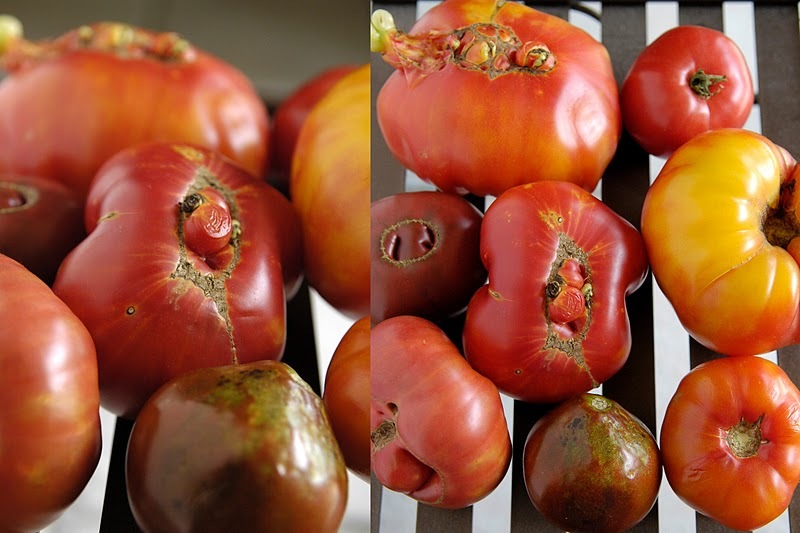 He said every single person said they preferred the flavor of the imperfect-looking, bumpy heirloom tomato. They were shocked at the difference in flavor. And then, almost without exception, they went inside and bought the pristine-looking cold-packed tomatoes instead.